The bravest of the bunch, Smarte leads the group with skill and confidence. she knows that adventure is out there and she wants to be part of the new frontier of space exploration. Half Human, Half Cyborg. Equal Parts Heart and Smarts. Digit helps the captain run the ship. She believes that space travel inspires new ways of thinking, imagining, and making friends. An alien from the planet alpo, morph loves going on INTERGALACTIC adventures with his fellow space crew almost as much as he loves learning about space. Morph is Always willing to go the extra mile to chase his dreams…or a comet. born in the town of Wapakoneta, Ohio, Armstrong flew as a naval pilot during the Korean war and joined the Naval Advisory Committee for Aeronautics (which would eventually become NASA) in 1955. He worked many jobs including engineer, test pilot, administrator, and eventually earned the title of astronaut in 1962. He was the first human being to walk on the moon as part of the Apollo 11 space mission. born in Ulm, Germany in 1879, Einstein had a gifted talent and an insatiable passion for mathematics and science even as a child. He won a Nobel Prize in 1921 for his Theory of Special Relativity (commonly known as E = MC^2)— one of the most famous equations in history. He helped to shape many of the foundations of modern physics. The Soviet Pilot and cosmonaut turned into an international celebrity when he became the first human being to venture into outer space. His Vostok spacecraft completed one full orbit of Earth on April 12, 1961. It would be his last space outing, unfortunately, as he died in a routine training mission in 1968. Often credited as “the father of modern science,” Galileo was born in Italy in 1564. His astrological observation that the earth revolves around the sun was in direct opposition to the popular beliefs of his time and He spent the final years of his life under house arrest. an American physicist, engineer, and astronaut, Ride is famous for being the first American woman in space. She continued to work with NASA long after her space flight days, even contributing to research behind the Challenger and Columbia disasters. a retired U.S. astronaut and doctor of biochemistry, Whitson holds the American record for most days in space! (665 days in space, the theoretical equivalent of a round trip to mars). She was also the first female commander of the International Space Station. Buzz the lunar module pilot for Apollo 11, Aldrin was the second human to set foot on the moon (nine minutes after his mission commander, Neil Armstrong). Since Armstrong took most of the pictures, Aldrin is the iconic astronaut in the photos from the moon landing. He was also the first astronaut with a doctoral degree. Guion born in Philadelphia, PA. Bluford was an incredibly accomplished and decorated pilot. He became an astronaut with NASA in 1979 and was the first African American to go to space. over the course of his career as an astronaut, he completed four flights, logging nearly 700 hours in space. On March 14, 1940, 11-year-old Venetia Burney was eating breakfast with her family when they heard about the discovery of a new planet. Familiar with Greek and Roman mythology, Burney suggested that they should name the planet Pluto. Her father worked at the university of oxford and brought up his daughter’s suggestion to a friend and professor of astronomy and the name stuck! A well-regarded U.S. pilot who applied to become a NASA astronaut in the early 1960s, Cobb was one of “The Mercury 13—” a group of 13 females who pursued astronaut training and were then denied by NASA. Cobb was later celebrated for using her pilots skills towards humanitarian causes. Copernicus was Born in Poland in 1473. He was an avid reader and a student of mathematics, astronomy, science, and philosophy. Among his other contributions to humanity, he was one of the first people to discover that the earth revolved around the sun and not the other way around. A test pilot for the U.S. military and a U.S. astronaut, Glenn is famous for being the first American man to orbit earth. After NASA, he became a senator and served as a politician for 25 years. Considered one of the greatest theoretical physicists of all time, Dr. Hawking was the recipient of the Presidential Medal of Freedom Award in 2009. He published many books, including the best-seller A Brief History of Time. Dr. Hawking was a professor at the University of Cambridge until his death in 2018. Hubble loved astronomy but pursued another career for many years. When he finally followed his passion, he made several discoveries that have changed our understanding of the universe. The Hubble Space Telescope is named after him because Hubble discovered that the universe is expanding. Johannes Kepler was a professor of mathematics in Graz, Austria. Kepler made many strides in an effort to convince the church that the Earth did indeed revolve around the sun. Kepler’s Third Law states that the way two planets orbit the sun directly relates to their distance from the sun. 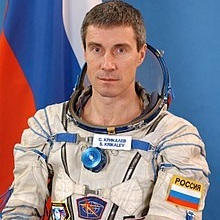 Sergei Krikalev was born in what is now St. Petersburg, Russia in 1958. He became a Soviet Cosmonaut at the age of twenty-seven and journeyed into space on several missions. Sergei was among the first crew on STS-60 Discovery— the first US/Soviet joint space shuttle mission. The Discovery made over 125 orbits around the planet before returning. Elon Musk was born in Pretoria, South Africa. Musk is the founder of many businesses, most notably Tesla— which focuses on energy— and Space X— which became the first private company to deliver cargo to the International Space Station. One of Musk’s current goals is to send humans to Mars and create a sustainable habitable colony there. A Soviet parachutist and cosmonaut, Tereshkova is famous for being the first woman and first civilian in space. When she landed back to earth 1963, she was celebrated as a hero of the Soviet Union.